In the following graph, the bottom curve (almost a horizontal line) shows the fraction of Australian GDP paid out in wages and salaries since 1989-90. Yes, the fraction is less than half. The middle (blue) curve shows the ratio of Australia's total residential land value at 30 June each year to GDP in that financial year; in other words, it shows how many years' GDP would have been needed to buy Australia's stock of residential land. The top (red) curve shows the ratio of Australia's total residential land value at 30 June each year to the total wages and salaries earned in that year; in other words, it shows how many years' wages and salaries would have been needed to buy Australia's stock of residential land. The real increase in Australia's total residential land value in the year to 30 June 2010 was roughly equal to the entire earnings of Australian employees in that year. But now the ratio of the total land value to GDP, or to total wages and salaries, is roughly back to where it was in mid 2009. 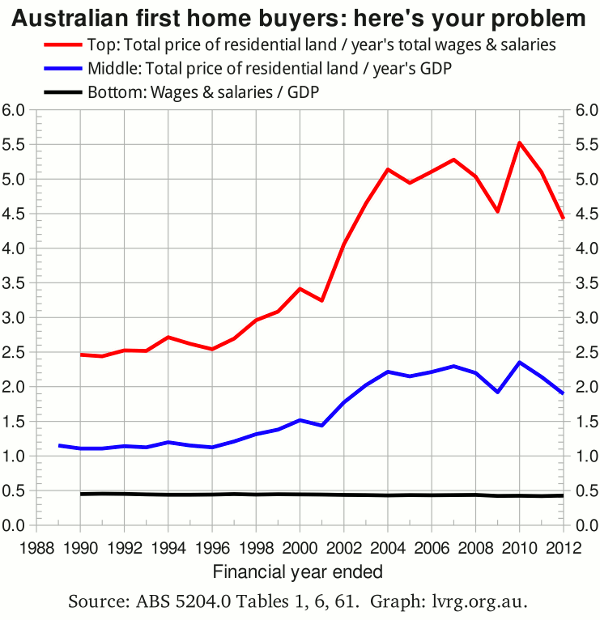 One might well ask what was achieved by the First Home Owners' Boost. One might further ask whether, if the entire grant offered in late 2008 had been reserved for new homes, it would have averted the land bubble of 2010 — or whether, if the original First Home Owners' Grant (FHOG) introduced in 2000 had been reserved for new homes, it would have averted both the post-GST construction slump and the land bubble of 2001 to 2004. The price decline from 2010 to 2012 would have to continue another two years to undo the effect of that bubble. If the Reserve Bank cuts the cash rate by 25bp on Melbourne Cup day, then not only land prices but also the official interest rate will be back at mid-2009 levels. But the fiscal stimulus won't be back; on the contrary, the Federal Government is doing its best to give us a fiscal contraction. So, while this year may look like 2009, it's a safe bet that next year won't look like 2010.